Carlos Gaytán refers to the time he spent as a contestant on the popular Bravo cooking competition show Top Chef as a “dream.” It was one that almost didn’t come true. Gaytán, who placed fourth out of 19 participants in the show’s 11th season, nearly let the opportunity pass him up due to family obligations. He even declined seven times before his wife and kids gave him the green light. 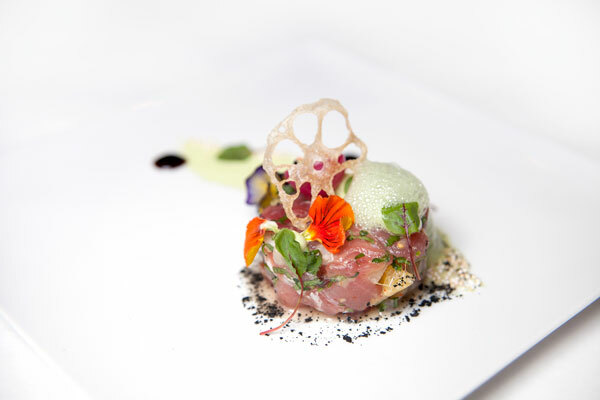 TUNA CEVICHE Raw ahi tuna with apple, pear, and pineapple relish over avocado mousse, topped with a ginger-mint foam and ground pepper, and garnished with a lotus-root chip and some petals. “It looks like a garden,” Gaytán says. The restaurant is a cozy, rustic, French/Mexican sanctuary with soft lighting, buttery scents, and Latin jazz flowing from the speakers that create an intimate vibe. He and his wife designed and developed the space themselves—certain parts by hand—over the past 10 years. Gaytán came to the US in 1991, immediately finding work as a dishwasher before getting the chance to cook at the Sheraton Hotel in Chicago under Jeff Miller, his first American mentor, who took an interest in Gaytán and his talents. Gaytán would move on to the Union League Club of Chicago, where he became a banquet chef. One day, before an important dinner for the French Consulate, a team of French chefs came in expecting to see the club’s executive chef, Michael Garbin, leading the kitchen—and saw Gaytán instead. Panicking that “a group of five Mexicans” wouldn’t be capable of preparing French food for 600 people, he recalls, they called in more reinforcements. Gaytán accepted the position at Bistro Margot, under the condition that Tougne would commit to teaching him French cuisine. Over the next three years, he studied under Tougne every morning, experimenting with French ingredients and techniques. He then began incorporating them into the style he adopted growing up cooking for friends and family in Guerrero, Mexico. But Gaytán has yet to encounter a challenge as trying as opening and maintaining Mexique, which has brought with it a constant series of unforeseen hurdles. There was the time when the building’s electrical deficiencies nearly prevented Mexique from ever opening, and when he had to hand-build a new podium just to meet a trivial code, and, most memorably, when the Michelin announcement came one day after he prayed he wouldn’t have to close. 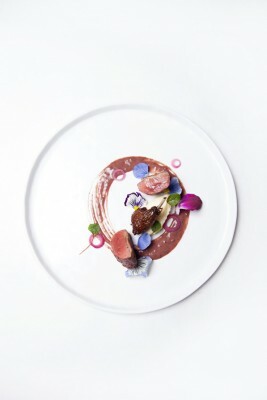 SQUAB Young domestic pigeon and puréd parsnips over a blueberry port wine reduction, garnished with petals. “If my plates are paintings, some are still life, others are watercolor. For the squab, I centered my visual inspiration around the color purple,” says Gaytán. Given these new commitments, Gaytán “cannot imagine” opening another restaurant, but if Mexique has taught him anything, it’s that the future is unpredictable.